The mSATA rush is officially on as desktop PC usage plummets and laptops, especially ultra-portables are the hot sellers. 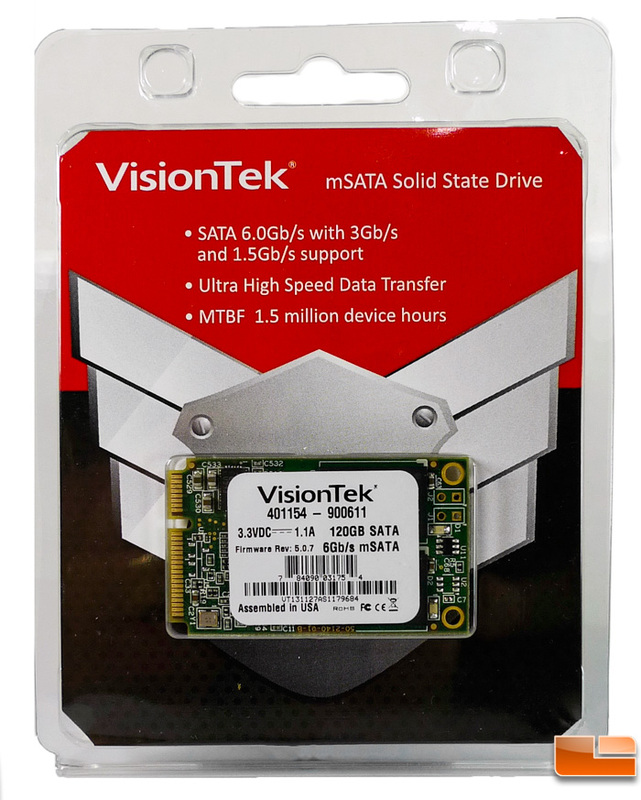 These devices are cramming more and more hardware into an ever shrinking space so why use a 2.5″ x 1/4″ drive when you can use an mSATA drive that’s roughly the size of a matchbook. VisionTek, best known for their graphics card products, has dipped their toes in the SSD pond and what better controller to start out with than the über-popular SandForce SF-2200 series controller that has been used by nearly every SSD maker on the planet. 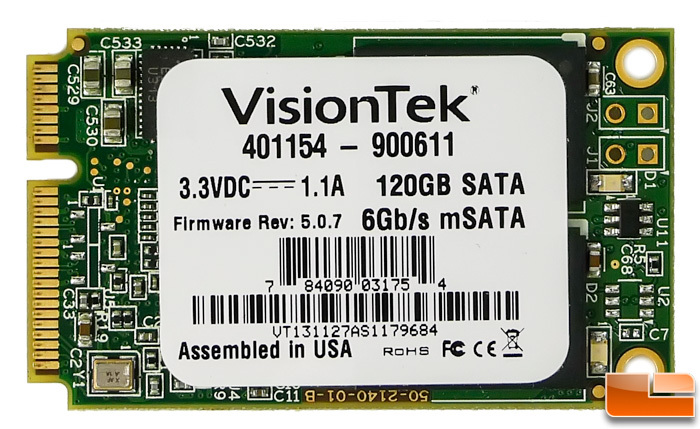 We also saw them leverage this same controller paired up in their PCIe SSD recently. They sent us over a 120GB version to test out so we rolled up our sleeves and got to work. We pretty much know what to expect out of this drive having tested similar configurations before but every maker has the opportunity to customize the firmware and tweak performance to their liking. Per their specifications, the drive can hit read speeds of up to 540MB/s and writes up to 425MB/s. The writes number may seem a little low to some but we know how the SandForce controller write performance varies with the type of data being written so it appears VisionTek took the marketing road less traveled and gave a more real-world performance expectation of the writes where most tout the absolute best case scenario figures. When it comes to the cost per GB, you get the most for your money right now with the 240GB capacity drive, but the 120GB drive that we are looking at today is right around a buck per GB as well. Being an mSATA drive, the only thing obscuring the good bits is a pesky sticker that’s a heck a lot easier to remove than many of the parts on drives we review. 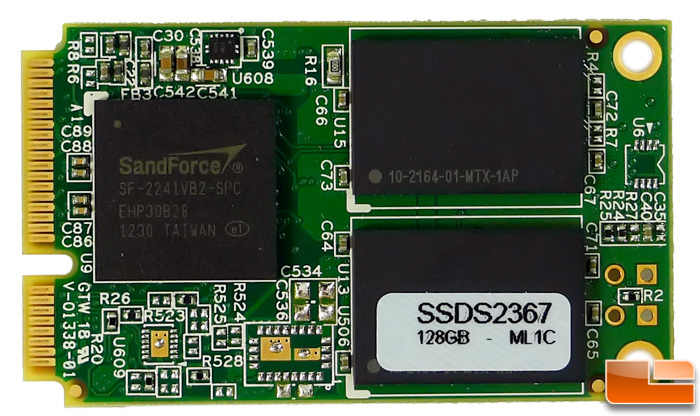 What we find are four NAND modules and a SandForce SF-2241 controller which we saw on the Kingston mS200 drive. The NAND chips are virtually devoid of identification marks so all we can really say is that it’s MLC and almost certainly 2xnm architecture. The SF-2241 controller is a four channel controller whereas the SF-2281 controller is an eight channel controller. The benefit is that it uses less power which is optimal for portable devices which are likely to use this part.